Whether you want to donate online via credit card or offline via check, giving is easy during Give Big. Use this chart to find the right path to giving for you! There are two ways in which you can give via check during Give Big in 2019. There are different directions for both options so please review the information below carefully. 1. DIRECTLY TO NONPROFITS - New this year! You can donate via check directly to the nonprofit of your choice! Write the check out to the nonprofit your donation is intended for. 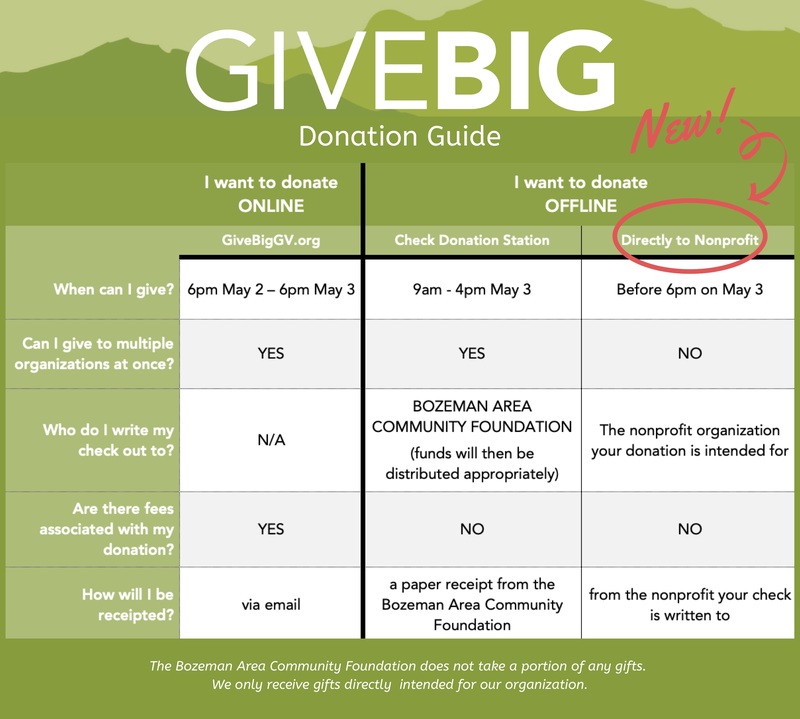 Make sure the nonprofit receives your check before May 3rd at 6:00pm so your donation can be added to their total funds raised during Give Big! You will be receipted by the nonprofit organization directly for offline donations written directly to them. 2. CHECK DONATION STATION - To donate to multiple organizations through one check, join us at the Check Donation Station at First Interstate Bank (202 W. Main St. Bozeman) on Friday, May 3rd between 9am - 4pm. Checks written at the Check Donation Station will need to be written out to the Bozeman Area Community Foundation (BACF). Check Donation Station donations must be accompanied by a Check Donation Station Form. Forms will be available at First Interstate Bank and are also available at the link below. BACF will then distribute your donations to the designated nonprofits appropriately. Donations made through the Check Donation Station are receipted by the Bozeman Area Community Foundation. Offline gifts do not count towards all prizes, but will be accounted for in the organization’s and overall Give Big totals. Offline gifts do count for Milestone prizes such as 2019th donor and $1.5 Million Donor. Offline gifts do not incur any fees. Offline gifts can be made completely anonymously. Are you a nonprofit leader looking for information on Matching funds? Matches are separate from other offline donations. Click here for more information!